The origin of the word is the Late Latin pergula, referring to a projecting eave. The English term was borrowed from Italian. It was mentioned in an Italian context in 1645, by John Evelyn at the cloister of Trinità dei Monti in Rome and used by him in an English context in 1654, when, in the company of the fifth Earl of Pembroke, Evelyn watched the coursing of hares from a "pergola" built on the downs near Salisbury for that purpose. Pergolas may link pavilions or extend from a building's door to an open garden feature such as an isolated terrace or pool. Freestanding pergolas, those not attached to a home or other structure, provide a sitting area that allows for breeze and light sun, but offers protection from the harsh glare of direct sunlight. 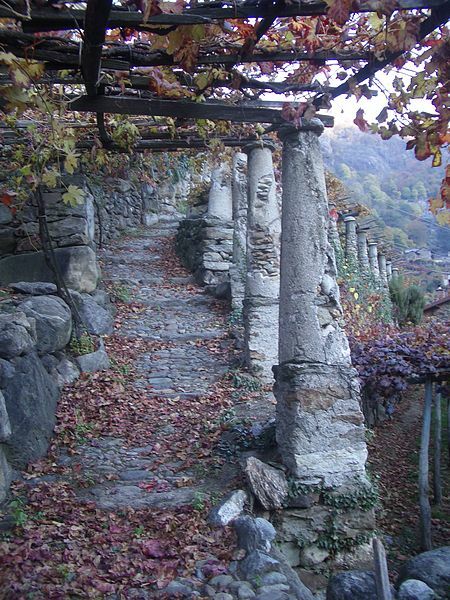 Pergolas also give climbing plants a structure on which to grow. Pergolas are more permanent architectural features than the green tunnels of late medieval and early Renaissance gardens, which were often formed of springy withies easily replaced shoots of willow or hazel bound together at the heads to form a series of arches, then loosely woven with long slats, on which climbers were grown, to make a passage that was both cool and shaded and moderately dry in a shower. At the Medici villa, La Petraia, inner and outer curving segments of such green walks, the forerunners of pergolas, give structure to the pattern, which can be viewed from the long terrace above it, and provide rare privacy in a teeming household, offering to those walking within it leafy glimpses into an orderly paradise, a formally-planted enclosed orchard that consciously recalled the Garden of Eden before Adam's Fall. The clearly artificial nature of the pergola made it fall from favor in the naturalistic gardening styles of the 18th and 19th centuries, but handsome pergolas on brick and stone pillars with powerful cross-beams were a feature of the gardens designed in the late 19th and early 20th centuries by Sir Edwin Lutyens and Gertrude Jekyll and epitomize their trademark of firm structure luxuriantly planted. A particularly extensive pergola features at the gardens of The Hill, Hampstead (London), designed by Thomas Mawson for his client W. H. Lever. Modern pergola designs of wood rather than brick or stone pillars are more affordable and are increasing in popularity. Generally, pergolas are either made from a weather-resistant wood, such as Western Redcedar (Thuja plicata) or, formerly, of Coast Redwood (Sequoia sempervirens), or are painted or stained.